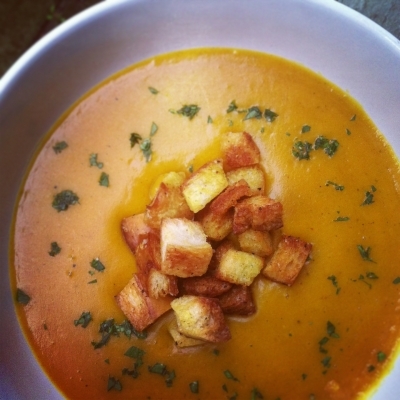 Because what's fall time without winter squash? This recipe can be done with any kind of winter squash, go crazy! Preheat oven to 400. Slice squash whole and drizzle with olive oil, salt, pepper, cayenne, curry powder and a dash of cinnamon. Roast for 30 minutes, or until you can easily pierce flesh with fork. Scoop flesh out and set aside. In the meantime sautÃ© chopped onion and garlic, and season with the same spices from before. Add vegetable stock, bring up to boil and simmer for 20 minutes. Add coconut milk and squash into the pot with the rest of ingredients. Mix and bring up to a boil for another 20 minutes. Blend everything together (in batches if needed) and add back into pot. This would be a good time to check seasoning and if needed, adjust. Bring up to a simmer for a few minutes before serving. Garnish with fresh herbs and croutons if desired!